Get the Knowledge and Inspiration you need to get the Best Pricing and Payment Solutions for your Business. We learned to speak the Bank Fees Language and it’s how we lower your fees. Sometimes people will ask what we do. Basically we translate credit card into english and act like an accountant or lawyer fighting for our clients money. Here is a video of us explaining some of the fees on a statement. Credit cards are the way of the world these days. It is important as a business owner to understand everything related to credit card processing fees and rates to ensure you are maximizing profits while minimizing expenses. Check out this article to learn everything you need to know about credit card processing fees. All you need to know to successfully switch merchant services in order to maximize your profits. How Do I Switch Merchant Services? Switching merchant services can be huge pain! Read our guide that will provide all you need to know to successfully switch merchant services in order to maximize your profits. Check it out now! Is your business looking to process credit cards through an app? Check out this article to learn the key things to consider when choosing which app is best for your company. Read it now! All the information you need on chargebacks and help you understand them so you can minimize these disruptions to your business. Any business that accepts credit cards will run into chargebacks. This article will provide all the information you need on chargebacks and help you understand them so you can minimize these disruptions to your business. Check it out now! At FeeFighters, we’ve been helping business owners comparison shop credit card processors for years. 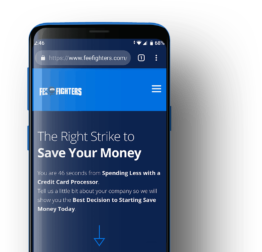 At FeeFighters, we’ve been helping business owners comparison shop credit card processors for years. One complaint kept resurfacing over and over for online merchants: what to do about the gateway? Learn a little bit about a samurai economics mindset. Diverse perspectives on business-related topics to help save on payment fees. If you own a small business or are thinking about starting one you must familiarize yourself with payment fees. Everything you need to know about enchanting and acquiring customers through digital channels. All of our blog posts in a single category.